Giving indulgent goodies as a token of thanks or love is classic, but what do you give to a health-conscious person? 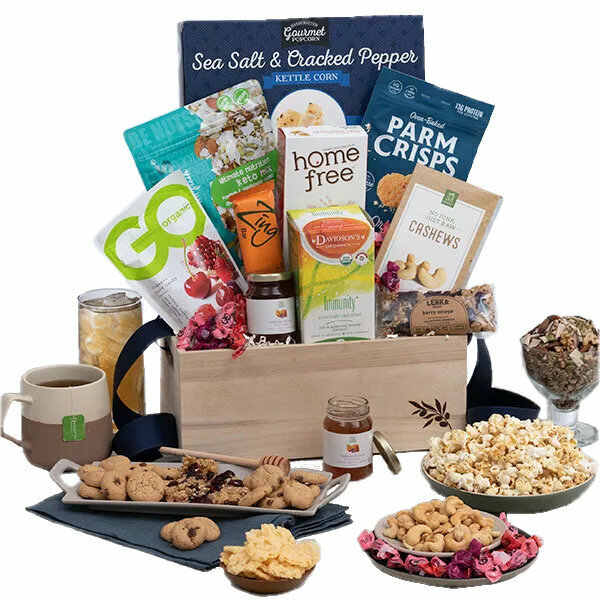 Our Gift without Guilt Basket, which includes delicious yet healthy treats - send our healthy hamper to anyone in the USA. Included in this guiltless combo is Blueberry Pomegranate Trail Mix Crunch, Roasted & Salted Peanuts, Savory Garlic Cheddar Cheese, Pretzel Twists, and more. Now you don't have to worry that your gift will ruin your recipient's diet!